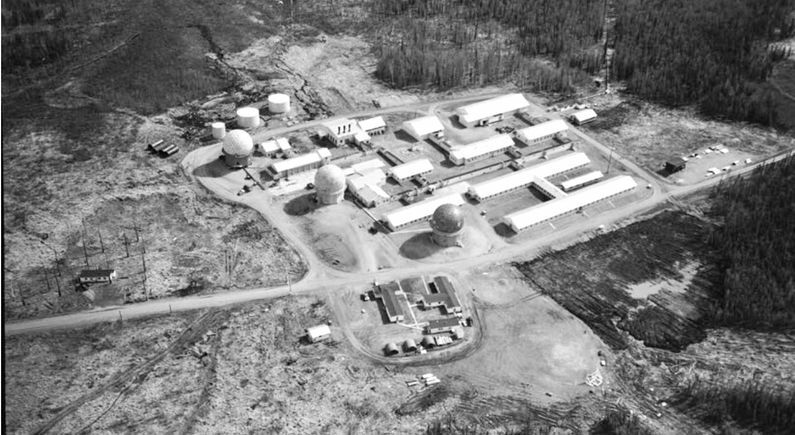 Campion Air Force Station (1952-1983) - A Cold War U.S. Air Force Station, part of the Alaska AC&W Radar Network. Named for 2nd Lt. Alan J. Campion who was killed in an F-94 aircraft accident 26 Nov 1950. Located along the Yukon River near the town of Galena, Alaska. Initially functioned as a Ground Control Intercept (GCI) site, with a Permanent System ID of F-08. Later redesignated a surveillance site feeding track data to a manual Direction Center. Closed after the establishment of the Elmendorf ROCC in 1983 and the establishment of the Galena Long Range Radar Site at the nearby Galena AFB instead of Campion AFS. Campion Air Force Station circa 1961. Campion AFS Sign Commemorating Lt. Allen J. Campion (Major Roger W. Ellsworth identified as Current Commander). Construction began 25 June 1950 and was completed in 1952 by the Morrison-Knudsen Company under a $2,238,000 contract. The site became operational 1 Jul 1952 and was known as Galena 2 or the 142d AC&W Squadron. 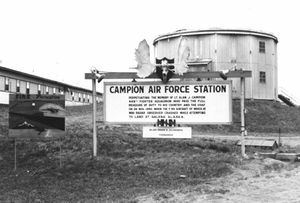 The site was formally dedicated on 10 Apr 1954 as Campion Air Force Station. The site initially functioned as a "Lashup" Ground Control Intercept (GCI) site using leftover WWII era radar equipment while awaiting more modern equipment. In 1953, Campion was changed to an air defense direction center and back to a GCI under NORAD on 13 Jun 1973. 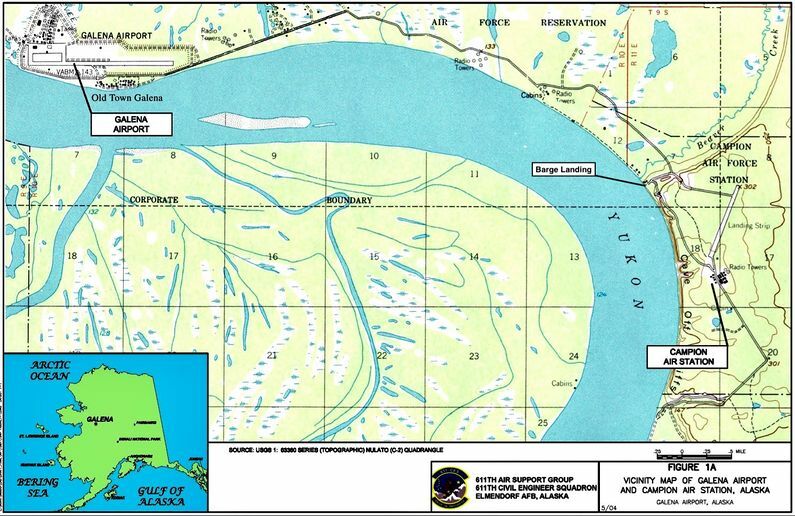 A 1970s organization chart shows Campion as a NORAD NCC with the Kotzebue Direction Center reporting to it along with input from the Point Barrow Dew Line facility. In 1973 Campion was realigned under the Murphy Dome NORAD Control Center. This status continued until the site deactivated in 1983. The site was first established by a detachment from the 532nd ACWS. Shortly after they were replaced by Det. F-8 of the 143rd ACWS attached to the 160th ACWG, an ANG unit. The 143rd was replaced by the 142nd ACWS, also assigned to the 160th. In early 1953, the Air Force’s 743rd ACWS, part of the 548th ACWG, replaced the 160th ANG unit. The 743rd AC&W Squadron operated Campion AFS until it closed. Lashup equipment at the site included a CPS-5 search radar. There is some conflict between sources about early equipment at the site but a photograph clearly shows a CPS-5 on a temperate tower circa 1954. An FPS-8 search radar was added in mid-1955. At some point, a FPS-3 search radar and one FPS-6 height-finder radar was added. The FPS-3 radar was later upgraded to a FPS-20 search radar and a FPS-90 height-finder radar was added. Later the FPS-20 was upgraded to a FPS-93A search radar. Later pictures of the site show three radomes presumably with the FPS-20 search radar in the center next to operations flanked by two height-finder radars (one FPS-6 and one FPS-90). Aircraft track data from these radars was manually plotted on plotting boards and passed to the Manual Direction Center on voice circuits. In 1965 the FYQ-9 Semiautomatic Data Processing and Display System was implemented on Alaska AC&W radar sites automating the passing of track data to the direction centers. The result was reduced manpower requirements and increased efficiency. Further reductions came on 1 Oct 1977 when the Alaska Air Command (ACC) contracted with RCA Services for site support services. This was a part of an Air Force effort to reduce remote tours and some 76 military positions were deleted at Campion. The remaining military personnel were primarily in operations. JSS common digitizers were installed on the AC&W radars sites, including Campion, by 1982. This upgrade enabled transmission of radar track data via satellite to the new Elmendorf JSS Regional Operations Control Center (ROCC) near Anchorage. The Elmendorf ROCC was activated on 14 Jun 1983 and that event triggered a series of events that included the closure of the AC&W sites, the disbandment of the AC&W Squadrons, and the creation of Long-Range Radar Sites (LRRS) with full contractor operation and maintenance and new FPS-117 3D radars. The nearby Galena Long-Range Radar Site was selected as the site of an FPS-117 Minimally Attended Radar (MAR) and Campion AFS was deactivated on 1 Nov l983 and the facility was later demolished in 1986. 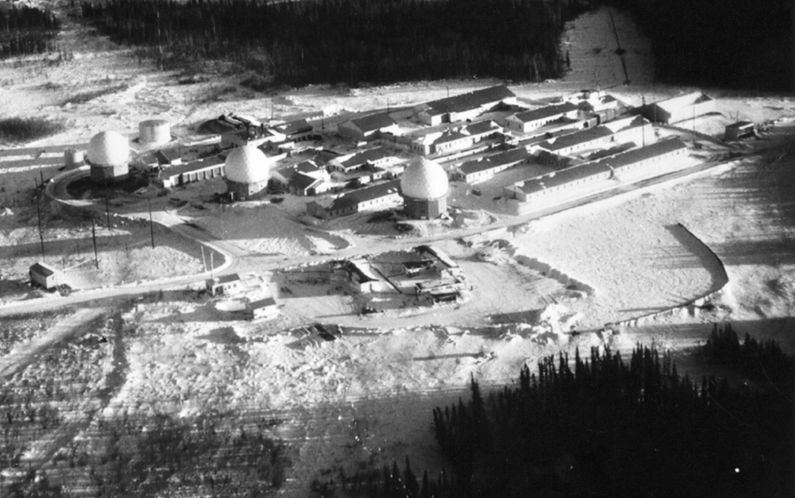 Campion Air Force Station in the Winter. The Campion AFS was not a split site and everything was at a common location. Campion AFS had the standard building schedule, with twenty-one wood-frame buildings, most connected by covered walkways. Three radar domes eventually replaced the one original CPS-5 radar on a temperate tower (no radome). A central power plant in building 105 served the whole site. Radar operations were located in building 101 next to the search radar tower in building 102. A gym/bowling alley building was added in the 1960s. It was possible to wear summer uniforms year-round if one did not go outside. No family housing was provided as this was considered a remote unaccompanied tour, 15 months in the beginning but later changed to 1 year. The station was resupplied annually by supply barges from 1951 until its closure. A barge landing-site for off-loading POL and other supplies was located about 1.5 miles northwest of the site, near the mouth of Beaver Creek. A 7,250-foot gravel runway was built as an auxiliary runway to the Galena AFB and was to serve Campion AFS as well. The expansion plans were canceled and the field was deactivated in 1954. The annual resupply effort was originally known as Mona Lisa, and in 1967 the name was changed to Cool Barge. See the vicinity map below for the Barge landing site on the Yukon River. Campion AFS was demolished by the US Air Force in 1986. Campion Air Force Station Composite Plan. 1?? Unknown Radio No May have been original Receiver Bldg. After HF radio systems proved inadequate for command and control communications, the Air Force implemented the White Alice Communications System. This was a system of tropospheric scatter and microwave radio relay sites constructed during the mid-1950s to provide reliable communications to Alaska Air Command (AAC) AC&W system. Building 118 is identified as the White Alice terminal at Campion AFS. Campion was tied into the new WACS system via the Kalakaket Creek White Alice site located south of Galena in 1958. Building 118 is identified as the White Alice terminal at Campion AFS. After the inactivation of WACS in 1978, Campion’s communications were switched to the nearby ALASCOM commercial terminal. All of the of the old AC&W radar site buildings have been demolished. The site has also had an environmental remediation project that has further erased signs of the old AC&W site. Now reportedly being used as dump site for the town of Galena. Campion Air Force Station and Galena Airport Vicinity Map (annotated). Location: Near the Town of Galena in the Yukon–Koyukuk Census Area, Alaska. Denfeld, D. Colt Ph.D., The Cold War In Alaska: A Management Plan For Cultural Resources, 1994-1999, U.S. Army Corps of Engineers, August 1994, 327 pages, Pdf, page 148-150. History of the Aircraft Control and Warning System in Alaska: Air Defense of Arctic Skies, Argonne National Laboratory, Illinois, 2002 updated 2013, 140 pages, Pdf, page 41-43. Reynolds, Georgeanne Lewis, Historical Overview And Inventory: White Alice Communications System, U.S. Army Corps of Engineers Alaska District, April 1988, prepared for USAF, Alaskan Air Command, Elmendorf Air Force Base, Anchorage, Alaska, 16 pages, White Alice USACE, page 16. This page has been accessed 450 times. This page was last modified 08:46, 31 December 2018 by John Stanton.